Hepatitis C is an infection that leads to the inflammation of the liver. 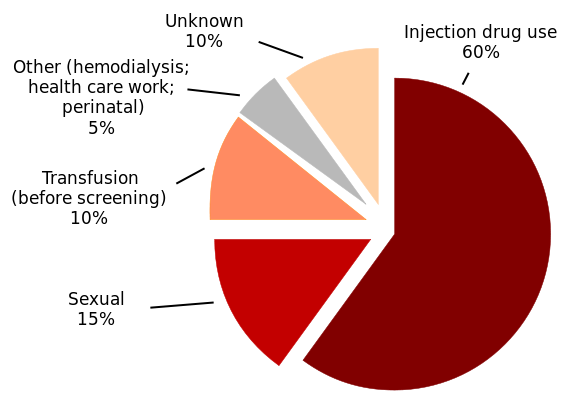 Hepatitis C can be transmitted from person to person in various ways; the most predominant via the use of drug injections (60%) as you can see on the pie chart on the right. The liver is responsible for so many essential tasks in the body; it processes blood and filters toxins and ensures no harm will come to your body via their action. The liver is also tasked with producing bile which helps in food digestion, and stores glucose and vitamins. When the liver undergoes inflammation, it gets extremely difficult for it to carry out all its important tasks. Hepatitis C infection has an effect on the entire body when left untreated for a long time. Hepatitis C has some very subtle symptoms that can be looked out for - its early symptoms include fatigue and yellowing of the skin. These are mild and are unfortunately easily dismissed. As the infection is left free to grow, other serious symptoms such as fever, skin problems and blood disorder may appear. Chronic liver infection leads to liver cirrhosis - the scarring of the liver. Treating Hepatitis C early helps prevent serious damage. On the other hand, leaving it untreated for years on end can lead to severe damage of the liver itself, liver cancer and consequently reduction in liver function. Here is a short intro about liver anatomy and function. The liver performs many functions that are crucial to the wellbeing of the body. One of the most important of which is the production of the substance that is needed to break down fat - bile. The bile is stored in the gallbladder and sent to the beginning section of the small intestine (duodenum). The bile is then combined with stomach acids and digestive fluids from the pancreas; this helps the intestines in absorbing nutrients into the bloodstream. Hepatitis C severely hinders the bile production ability of the liver. Inflammation also makes digesting food, especially food rich in fat very painful, This causes pain in the upper right portion of the abdomen in infected persons. This is due to a build-up of fluid in the stomach (ascites). A healthy liver produces just the right amount of albumin; this is a protein that helps regulate the amount of fluid in cells; however, a damaged liver does not produce enough albumin and this leads to fluid build-up in the stomach causing pain. There are some other digestive symptoms to look out for; including vomiting, loss of appetite and nausea. Additionally, stool may become clay-colored or pale, and urine may darken. Toxins cause damage to the central nervous system; however, a healthy liver filters these toxins and ensures your body is free of them. When the liver is damaged, it ability to filter these toxins is greatly hampered and the toxins can damage the central nervous system (hepatic encephalopathy). This leads to a variety of symptoms which include weakening of motor skills, sleep disturbances, and sweet or musty breath. When these symptoms are ignored and the toxins are left to build up, they damage the brain causing confusion, inability to concentrate, forgetfulness and personality changes. If still left untreated, advanced symptoms that may come up include disorientation, agitation, abnormal shaking and slurred speech. In severe cases, a coma might occur. Apart from the cleansing of toxins from the bloodstream, the liver does the vital function of producing proteins that are needed for a healthy blood and to regulate blood clotting (liver synthesis of coagulation factors). A liver that is not functioning properly creates blood flow problems and increases pressure in the portal vein (the vein that leads to the liver). This causes portal hypertension. Blood is then forced to find an alternate vein to flow through; if a smaller vein is unfortunately chosen, the vein would burst and lead to variceal bleeding (serious internal bleeding). The liver also extracts iron from the blood and stores it for later use; however, a poorly functioning liver is unable to do that which can result in anemia. Additionally, the liver converts sugars into glucose and then stores it for energy in the form of glycogen. Having too much sugar in the bloodstream leads to insulin resistance and causes type 2 diabetes. Hepatitis C antibodies in the bloodstream can be detected by carrying out a simple blood test. If antibodies are discovered, it means you have been exposed to the virus. In most cases, a second blood test is needed to confirm a hepatitis C diagnosis. The red blood cells contain a protein molecule called hemoglobin; it helps transports oxygen to cells throughout the body. To obtain and sustain healthy skin, nails and hair, iron is crucial. Another important substance in hemoglobin is bilirubin. When the liver is incapable of doing its job, bilirubin builds up, causing jaundice (a condition where the skin and the white of the eyes turns yellow). Hormones are regulated by the endocrine system. The thyroid gland which is part of the endocrine system, delivers hormones into the bloodstream. Hepatitis C sometimes causes the immune system to attack and damage thyroid tissues. This can lead to hyperthyroidism (an overactive thyroid); this in turn causes weight loss and sleep disorders. It can also cause hypothyroidism (an underactive thyroid) which makes you feel and act sluggishly. Research carried out by the Hepatitis Trust has shown that this condition is more prevalent in women than in men.